OCast. cigunnuela, L. Ciconia ciconia, Eng white or black stork. During the Middle Ages it was among the large birds hunted along with bittern, mallards, quails and herons. Although disappearing in rest of Europe today, since 1918 its population has been ever increasing in Spain, which is the largest concentration on the continent. This migratory bird winters south of the Sahara and in South Africa. It migrates in spectacular flocks to the two extremes of the Mediterranean. Those from the former area tend to use the Straits of Gibraltar route, which can take some as far north as the French-German border. The black stork may go as far as Denmark, Belgium and Luxembourg. The South African storks take the Bosphorus route. In March or April, they go to eastern Germany, the Czech Republic, Greece, northern Turkey, Russia, the Baltic States and the Caucasus. The Gibraltar group tends to reach to Spain in February. The white stork stays through July, while the black stork remains until August or September. The Bosphorus groups will stay in the east until September or early October. There is a small group of black storks, however, that is a permanent resident in central Iberia. In Spain, it is abundant particularly in Picos de Europa (Asturias), the Guadarrama River (Madrid), the Sierra de Gredos (Ávila), between Cáceres and Trujillo, Monfraqüe and the Jerte River Valley (Cáceres), Tablas de Daimiel (Ciudad Real) the National Parks of Coto Donana (Huelva), and the Guadalhorce Estuary (Málaga). Since the medieval times, the arrival date brought ‘stork luck.’ It is exactly nine months after mid-summer, when the husbands came home from wars to harvest their crops, which at the same time could have been considered as the human mating season. While the mother nurses the new comer in the household (brought by the stork of course), the stork and its mate build a new nest or the male, followed by the female, may occupy the one he used the previous year on a church top, roof of barn or house as appropriate trees are more and more difficult to find. Although white storks squawk at humans from time to time, they do not seem to mind human presence. The black stork appears to flee towns and cities more, making its nests near streams, ponds in forests, wet meadows, parts of mountain ranges on rocky crags and cliff-faces. Their nests consist of twigs, branches, clay, rags or whatever is found. If the nest is from a previous year then, a few tidbits are added to reinforce it or for decor. By Easter bird watchers from all over Europe come to photograph this bird with a red bill, legs and claws. It weights between 2.5-4.5 kilos and is 2 to 2.10 m long and 1 to 1.5 m tall. The stock lives to be about 20 years old and from the time it is four, the female lays one to six white eggs annually. It eats fish, mollusks, lizards, snakes, frogs, rats, garbage and insects. It has no “menu of the day” but varies its selection constantly. Hello Susan, here I am again! The story about the roofs is true, but from some years measures have been taken in order to protects buildings and storks at the same time. In most places they remove old, heavy nests that are not used anymore. In others they build iron "towers" for the storks to make their new nests (which are not very pretty to look at, by the way), and in other they reinforce the structure of roofs and keep an eye on the nests. If I could I'd send you pictures of the Salamanca University, and also of University of Alcalá de Henares, where the storks are part of the monumental appeal and so have been encouraged to remain. But there is a question for you: in medieval times they were supposed to eat storks? How and when? 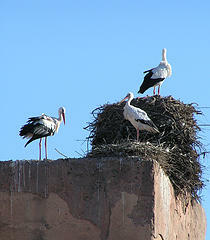 It is good news that funds are being made available to protect buildings and to let the storks live their lives. In medieval times storks were eaten like swans. Hunting then was like today, animals were not killed during the mating and reproduction seasons. This is a practical reason for Lent. A assume that storks were hunted after the chicks left the nests.